More importantly, it would be a missed opportunity not to tap into the wisdom and experience of the corporate crowds. Corporate innovation is about creating an innovation mindset across the whole organisation rather than setting up a separate mini R&D department. On the one hand, you don’t want these concerns to kill ideas early on. You’re still in a creative phase and the idea will change a lot, possibly rendering these concerns irrelevant. On the other hand, ignoring these concerns may very well cause the person expressing them to drop out from the innovation effort, feeling his worries are being ignored. They are a great workshop tool: put a large print-out on the wall, grab some post-its and team up around it. A one page canvas will quickly put a group of people into creative and collaborative mode. It helps overcome what I call the blank-paper-syndrome: some people have difficulty to come up with the first thing to write on a blank piece of paper. The pre-conceived structure of a canvas makes it easier to express those first thoughts. It gives everyone a quick overview of the idea. Due to space limitations, you are automatically forced to be concise and specific: what is really the core of the idea? It challenges your idea by forcing you to look at it from different angles. The different boxes or viewpoints also enable you to make the link to other people, activities or departments in your organisation, potentially getting more people engaged in your innovation efforts. The innovation canvas supports the first stages of innovation: getting your idea out of your head in order to get feedback, improve it and help define the next steps to take. It is obviously based on existing canvases, but I added two boxes to overcome above concerns. “What added value can our organisation provide?” allows you to make the link to your organisation’s strategy and value proposition. You can use it to specify the strategic relevance of the idea, any concerns about the strategic relevance, or leave it empty as a sign you don’t know how the idea fits with your strategy yet. An empty box doesn’t mean you have to stop the idea, it just means you haven’t thought this aspect through yet. “Key enablers and competences” allows you to put “This is the way we do things around here” concerns on the canvas. It’s also the right place to write down any missing capabilities anyone thinks you need for this idea to become a success. In follow-up posts, I will be sharing examples, explain the different parts of the canvas in more detail, and show how it helps me guide the validation process. 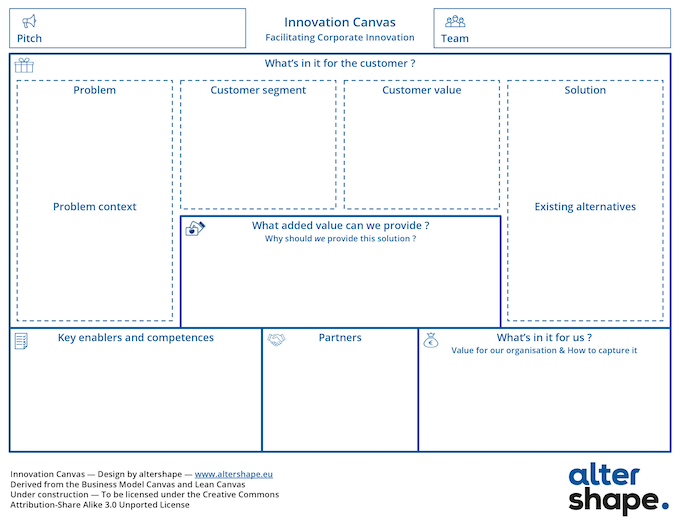 However, the innovation canvas should be fairly self-explanatory, so feel free to have a go and let me know about your experience with it! You can download the canvas here. If you want to know more about the innovation canvas, you can join IIBA Brussels’ next event, where Kristof Detaellenaere will show how he used the innovation canvas on one of his projects. I developed the innovation canvas during my work for Euroconsumers, an international group of consumer organisations. I first presented the innovation canvas during last June’s Intersection conference on strategic enterprise design. While I find the Business Model Canvas a great tool, I noticed it triggers people to focus on the complete business, pulling away attention from the customer’s problem. In the early stages of innovation, you really want this customer focus, so I needed a canvas that emphasises this more. The Lean Canvas offers a great way to organise your idea development around the validation of assumptions in problem, solution, market and business model. But it has no clear place to describe how the idea can fit in an existing organisation. This is something I felt I needed to add.